EUR/USD trades above 1.1300, holding onto its gains. Optimism about trade talks supports a better market mood. The technical picture is bullish, but the pair is on the verge of overbought conditions. EUR/USD is getting comfortable above 1.1300, extending the trend it began in early April. The move is slow but persistent. The calm in markets certainly helps, after a busy week. The latest positive diver is US-Sino trade talks. Both sides are optimistic, saying that progress has been made. According to reports, the US dropped its demands related to government intervention in the economy. The role of the state was one of the issues in talks. US President Donald Trump had an additional impact on markets. He criticized the Federal Reserve once again, saying that stocks would be much higher had it not been for the Fed's policies. There is a growing fear of intervention. European Central Bank President Mario Draghi expressed concern about Trump's interference, without saying his name. The economic calendar is not very busy in the wake of the short Easter week. The German central bank, the Bundesbank, releases its monthly report later today and may repeat its concerns about a slowdown. In the US, the Empire State Manufacturing Index is projected to rise in April from 3.7 points reported for March. FOMC Member Charles Evans speaks in two occasions. All in all, the market mood around trade talks is set to move EUR/USD. The current calm underpins the quiet climb. 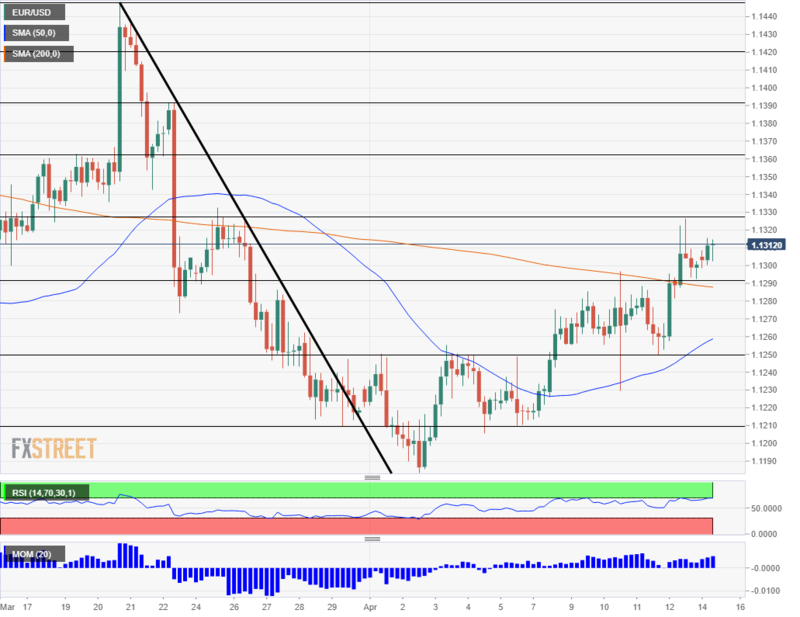 EUR/USD extends its rise, and it recently surpassed the 200 Simple Moving Average on the four-hour chart. Momentum remains positive, but the Relative Strength Index is already flirting with overbought conditions, at around 70. This implies a correction or a pause before the next upward move. Initial resistance awaits at 1.1328 which was the high point on Friday. Further above, 1.1365 capped the pair in mid-March, and 1.1390 was a swing high later that month. 1.1420 and 1.1445 are next. 1.1290 is the immediate support line. The line separated ranges in recent days. 1.1250 was a low point late last week, and 1.1210 provided support in early April. The 2019 trough of 1.1176 is next. Sentiment turnaround to further support the euro?